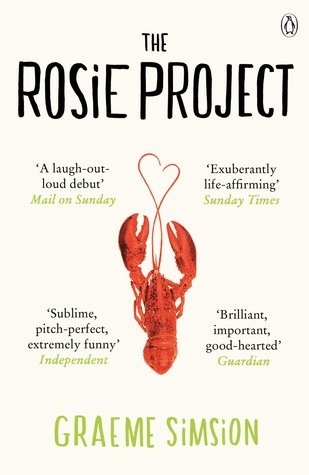 I read and loved the ‘The Rosie Project’ last year, so I had really high hopes for this sequel. Unfortunately this book did not live up to my expectations. Whereas in the first book I found Don and Rosie, the principal characters funny and unique, in this book I simply found them irritating. In the last book they brought out the best in each others’ characters whereas in this book they bring out the worst, as a result this book lacks the charm of the original. ‘The Rosie Effect’ follows Don and Rosie a year into their marriage, living in New York and expecting their first baby. Having just been through a pregnancy myself, I found this book so frustrating. Pregnancy is an exciting and joyful time that should bring the prospective parents closer together, but Don and Rosie spend the entire pregnancy making each other stressed and unhappy due to their inability to communicate. What was in the first book a sweet and offbeat romance is in this book a dysfunctional marriage. Obviously the book has a happy ending, but the large majority of the book is taken up by misunderstandings and misery and the end cannot make up for the preceding negativity. Last year I went to see Simsion talk about ‘The Rosie Project’. He explained how it was years in development, starting as a screenplay and creative writing thesis. I think that is probably why the first book is so well written. In contrast this book must have been written very quickly for a fast release off the back of the success of the first book, and I think it shows; it’s a far less well written and entertaining book. For example, Don is supposed to have thoroughly researched pregnancy foods and sets up a meal for Rosie where one of the dishes is liver, which is actually a food which you are advised not to eat when you are pregnant. This shows a lack of research which undermines Simsion’s characterisation of Don. This is still a very easy read and in places is humorous and made me smile, but it just didn’t live up to the heights reached by the first book.